Quick & Kosher: Recipes from the Bride Who Knew Nothing by Jamie Geller. 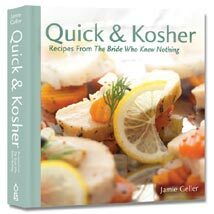 Jamie Geller’s Quick & Kosher: Recipes from the Bride Who Knew Nothing. Would you take cooking advice from a bride who knew nothing? If your answer is 'no' then I highly recommend you reconsider. Three years ago, Jamie Geller was a fast-track TV producer who didn’t know a saucepan from a spatula. But her new husband, from whom she initially hid the news of her kitchen ineptitude (she jokes that her backup title might have been the I Didn’t Tell Him I Couldn’t Cook Cookbook), patiently guided her to a point of basic comfort in the kitchen. As a baalas teshuvah (a non-Orthodox woman who adopts a traditionally observant Jewish lifestyle), Jamie’s intention to take on the cooking and entertaining demands of her household with grace and ease—and her insistence that every dish take no more than 15 minutes to prep—led her to become not only competent, but downright masterful at making beautiful meals a snap. Quick & Kosher: Recipes from The Bride Who Knew Nothing --- the newest addition to my cookbook collection --- is a terrific new cookbook from Feldheim that makes a great Chanukah present. In addition to the many super-fast takes on traditional Jewish dishes, I’ve been enjoying Jamie’s diverse international offerings, such as her Curried Coconut Couscous, Avgolemono Soup, and Berry Crème Brule; and the easy, elegant and mouth-watering desserts, among them Peanut Butter Chocolate Chip Mousse Pie, Strawberry Shortcake Trifle, Chocolate Quesadillas, and Puff Pastry Apple Purses. Special features of the cookbook include full-page color photos for most recipes, sections on setting up your kitchen and shopping like a pro, secrets of the 15-minute chef, and an informative guide to wine from Hagafen Cellars of Napa Valley. The book closes with some terrific Jewish holiday menus and a glossary of Yiddish, Hebrew, and Arabic terms used in the book. I offer you now this sampling of recipes from Jamie’s menu for a Quick & Kosher Chanukah, with wishes for a gut yontif and much joy this festival of lights. Preheat the oven to 425 degrees F. Lightly grease a cookie sheet with cooking spray. Place challah on prepared cookie sheet and spread liberally with butter or margarine. Sprinkle bread slices with crushed garlic, parsley flakes, and onion powder. Bake at 425 until slightly toasted and edges are crisp – watch, as challah tends to toast quickly! Lightly grease a 9" x 13" pan with cooking spray. Sprinkle with salt and 1 tablespoon of dill. Bake, uncovered, at 450 for 10 minutes. In a bowl, mix sun-dried tomatoes, cheese, remaining dill, olive oil, lemon juice, and mayonnaise. Remove fillets from oven and turn over to broil; spread sun-tried tomato mixture over fish. Return to oven and broil for another 4 to 5 minutes, until cheese topping is lightly browned. Cut potatoes lengthwise into halves or quarters so they fit into food processor feed tube. Process potatoes using the blade that creates think, shoestring-like strips and transfer to a large bowl. Drop 6-8 spoonfuls of mixture into hot oil. Using the back of a spoon, pat down each latke to flatter it. Put as many as you can in the skillet without crowding. Putting them too close together will make them soggy. Serve warm with applesauce and/or sour cream, if desired. Place romaine in a large salad bowl. Add croutons and sun-dried tomatoes. In a separate bowl, whisk together dressing ingredients until smooth and creamy. Serve immediately with grape tomatoes, if desired. Note: Using Worcestershire sauce can be tricky for those who follow the tradition to separate meat and fish, because Worcestershire sauce contains anchovies. Check the kosher certification mark. When it is accompanied by a "fish" notation, it means that the level of anchovies is greater than 1.6% of the whole product. When the kosher certification mark stands alone, the percentage of anchovies is less than 1.6%. When using Worcestershire sauce with meat dishes, use a brand with a stand-alone kosher certification. Knead until all ingredients are combined and a sticky, doughy batter is formed. Cover with a kitchen towel and let it rest for 15 to 20 minutes. When dough is ready, uncover and raise heat to high. Scoop out a tablespoonful of batter and drop in oil. Don’t make the doughnuts too big, so they can cook through. Roll each doughnut in confectioners’ sugar. Or, shake 3 doughnuts at a time in a paper bag filled with confectioners’ sugar.